Riyadh, Kingdom of Saudi Arabia - Nokia and Saudi Telecom Company (STC) have signed a Memorandum of Understanding to collaborate on the development of 5G and IoT use cases. Under the terms of the MoU, Nokia and STC will carry out trials of technologies such as 4.5G Pro and 4.9G, key steps on the path to 5G to build the capacity and throughput speeds needed for new applications. The collaboration will also play an important role in STC's digitalization transformation and its support of Saudi Arabia's 2030 Vision for transforming the country to be the hub connecting three continents including Asia, Africa and Europe. 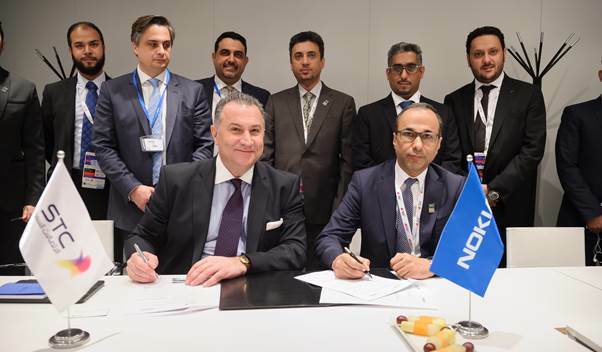 The MoU was signed at Mobile World Congress by Nasser Al-Nasser, Senior Vice-President of Technology and Operations at STC, and Samih Elhage, President of Mobile Networks, Nokia. With its ultra-low latency and extreme broadband network capacity, 5G will enable new possibilities in a number of vertical industry sectors, including connected cars, industrial networking, remote healthcare, virtual reality and ultra-high definition video services. With Nokia's mobile broadband expertise in 4.5G Pro and 4.9G, STC will be able to commence the evolution of its existing network toward 5G, preparing its infrastructure for the massive increase in data, devices and applications that 5G and IoT will facilitate. Nasser Al-Nasser of STC, said: "Our mission is to enrich our society by introducing pioneering services to the people in the Kingdom, and we are proud to enter into this MoU with our long-term partner Nokia to achieve this mission. We aim to bring the first commercial 5G network to the gulf region, and we are confident that Nokia's innovations toward the development of 5G technologies and IoT use cases, and their trials around the world, will provide a clear path for this." Waseem Al-Marzogi, head of the STC customer business team at Nokia, said: "We are pleased to collaborate with STC, a highly innovative services provider, to develop next-generation broadband services as well as IoT applications for smart cities in the Kingdom. 5G and IoT are the main pillars of STC's 2020 Vision, and Nokia is committed to enabling extreme broadband services, critical machine-type communications and IoT services, creating a super-efficient infrastructure for STC." Nokia and STC will develop 5G and IoT applications that will use STC's network, through advanced trials of 4.5G Pro and 4.9G technologies. The trialing of Nokia's small cells and enhanced Centralized RAN to prepare for 5G ultra-dense deployments and IoT use cases. Cooperating on the network modernization for 5G and the evolution to Cloud, leveraging Nokia 5G-ready AirScale radio, Nokia AirFrame data center platform, Centralized RAN, cloud RAN, massive MIMO and network slicing, Nokia Multi-layer Optimization SON. Nokia to closely cooperate with STC by regularly sharing latest released concepts, news on product launches, while STC will share its views on industry trends. STC to allow Nokia to showcase its latest innovations in the STC network to Nokia's existing and potential customers from other regions.